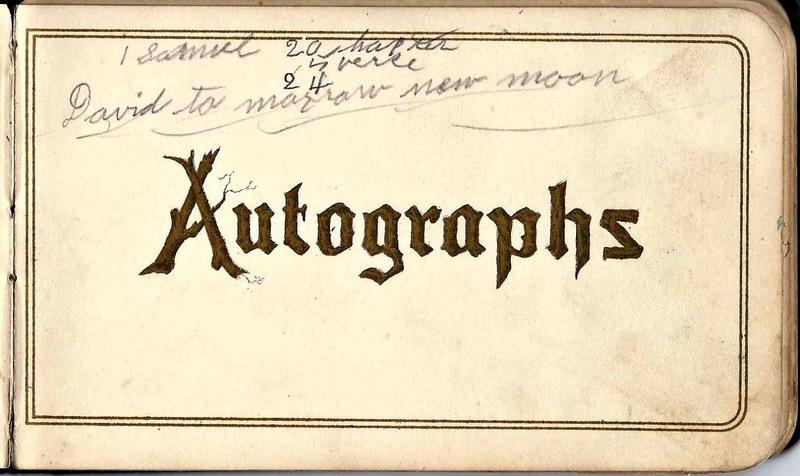 1883-1903 autograph album that belonged to Lillie Wolf of Steuben, Ohio. Note: be sure to scroll down to the comments section for information on Lillie's parents, her step parents, sibling and half siblings. 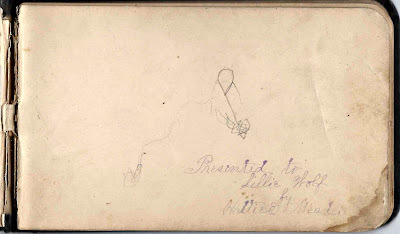 Hattie E. Mead presented the album to Lillie. 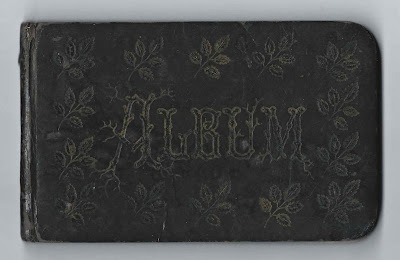 The album is approximately 5-1/2" x 3-1/2'' and contains 35 pages signed by Lillie herself, her relatives and friends. An alphabetical list of the signers appears at the end of this post. 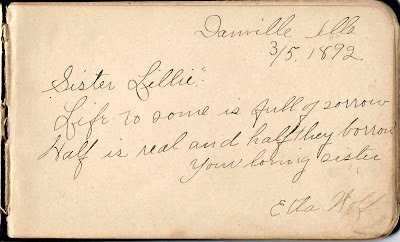 It appears that Lillie's autograph album came to light again at some point around 1903, after her 1892 marriage to Sanford Rusk, when her son Elmer Rusk took the opportunity to write in it. 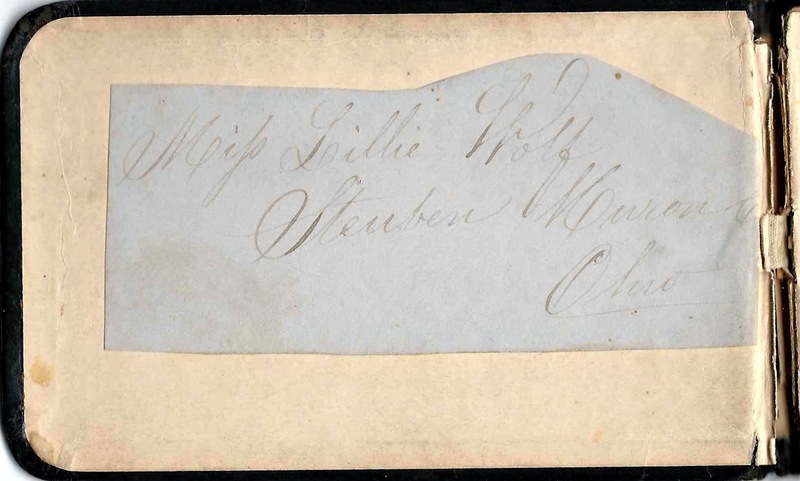 The message is confusing as he implies that Lillie is single, but perhaps he was pretending to be a signer in her album in the same vein as her contemporaries had 20 years earlier. 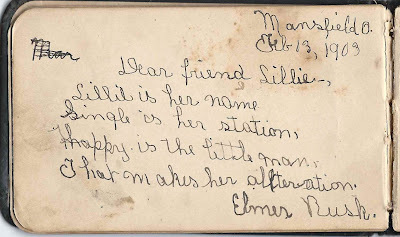 From online research, hopefully correct, and with information provided by the reader's comment, Lillie Wolf was born 26 January 1862 in Ohio, the daughter of George Wolf, who at the time of her birth was serving in the Civil War, and Lucy (Jordan) Wolf. Lucy died 14 January 1865. George Wolf married Jennie Weaver in 1866. 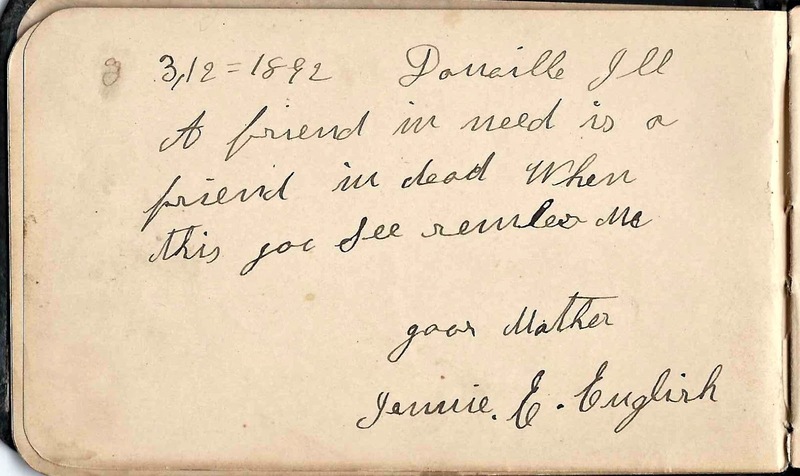 George died in 1885, and Jennie then married Ben English in 1886. 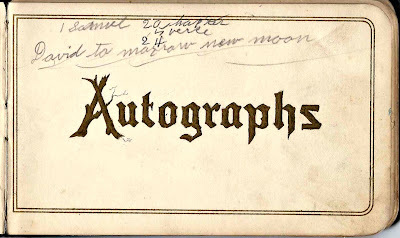 Jennie signed the page below in 1892. 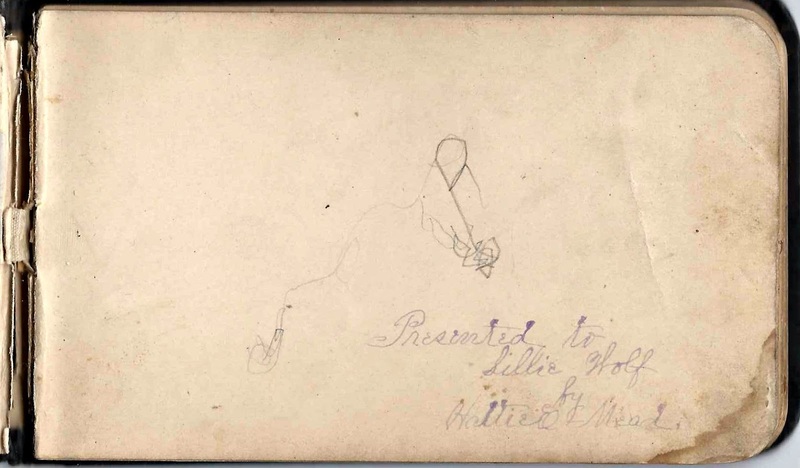 Two of Lillie's siblings signed pages in her album. 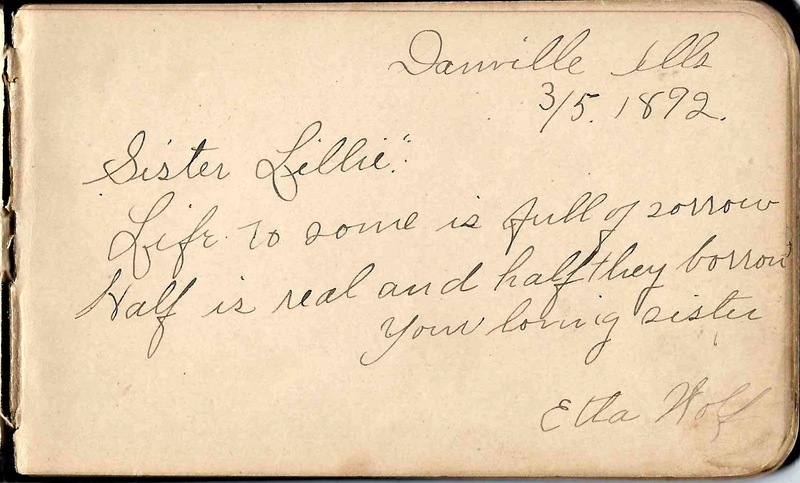 Half sister Etta Wolf, daughter of Lillie's father George Wolf and Jennie (Weaver) Wolf, signed a page at Danville, Illinois, in 1892. 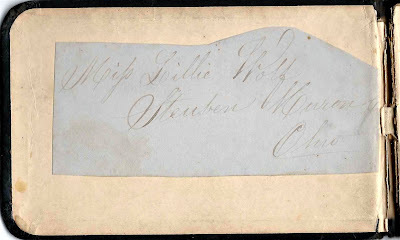 Lillie's brother P. J. Wolf signed two pages in her album. In one he indicated that he was working as a brakeman, and in the other gave the number of his Baltimore and Ohio caboose as 1646. 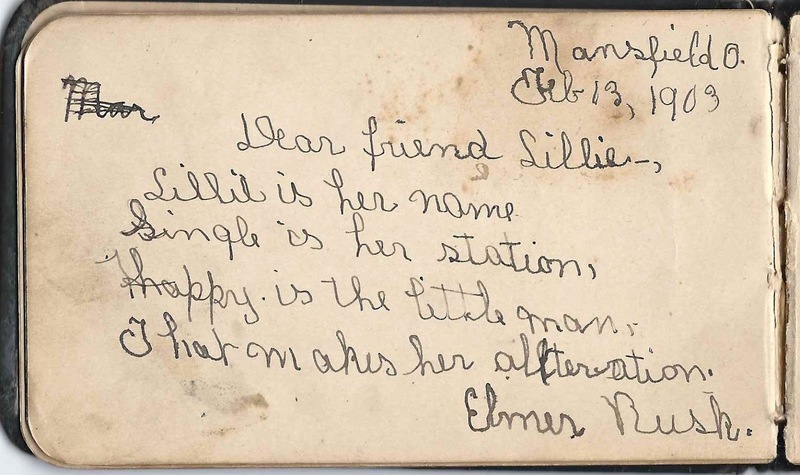 The reader in the comments section mentions Lillie's full brother Philip Emery Wolf, born in 1856. Perhaps Philip had an additional middle name to account for the J. If you can fill in some of the missing information on the Wolf and Rusk families, or if you have information on any of the signers listed below, please leave a comment or contact me directly. Thanks! Frances Ashley of Homer, Michigan; middle initial maybe S. or L.
Mr. Frank Gray of 408 East Cherry Street, signed 12 March 1892. He mentions Danville. E. D. Lahm or Lahn or ? 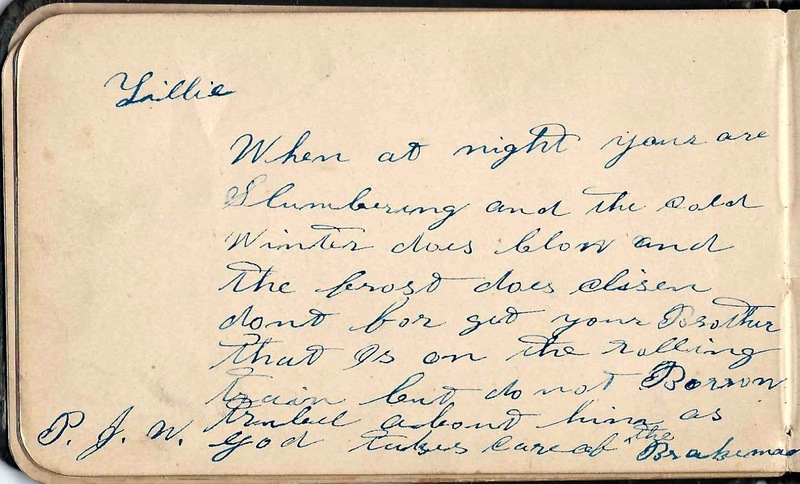 Elmer Rusk, signed at Mansfield, Ohio, on 13 February 1903. He indicates that Lillie is still single at this time. I don't know if this is meant to be a joke or not, but Elmer's parents were Sanford & Lillie (Wolf) Rusk. Elmer was born about 1893. 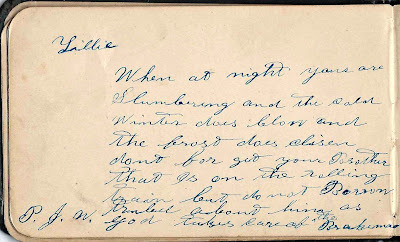 J. Stotts, signed at Chicago, O., on 26 July 1893. I searched for a Chicago, Ohio, and couldn't find one. Perhaps the signer used O. in error. 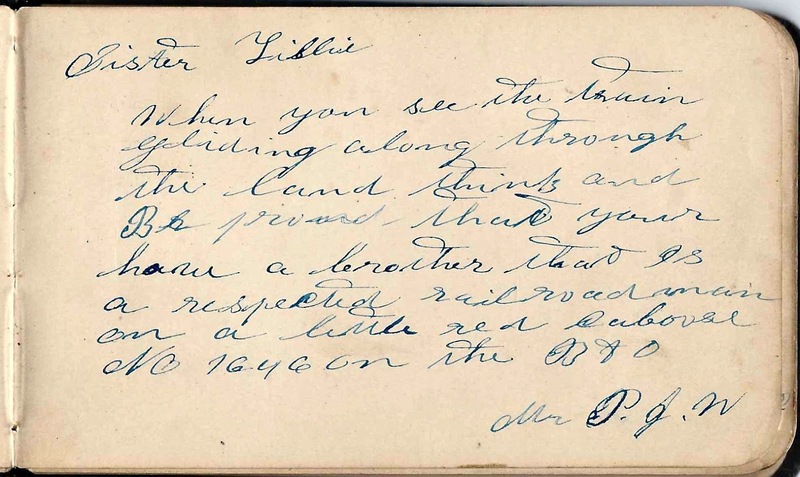 P. J. W., who refers to himself as Lillie's brother P. J. Wolf and his occupation as brakeman on a train. 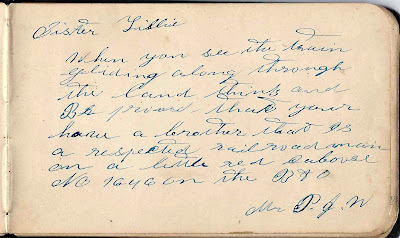 He signed another page and identified his caboose as B&O No. 1646. Thank you so much for this additional information, particularly on Lillie's mother and stepmother/stepfather and sibling/step sibling. I'm amending the post with a note for future readers to scroll down to your comment.